Dogs in School?!? What does ADA Say? Why yes, it is true you may indeed see service dogs in school. One of the most asked questions about service dogs working with children is do they have access to school. Does a school have to allow a service animal in with a student? The federal law, the Americans with Disabilities Act (ADA), does require access for these canine tools in all areas where members of the public are allowed to go—including schools. It goes on to say more about the responsibilities of both the facilities (schools) and the users. 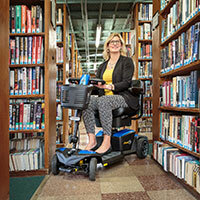 The ADA secures access for all tools being used by a person who has a disability so that those tools can help that person to expand their independence. The ADA is clear that the facilities (including schools) must allow for the service animals to enter and have appropriate access to the environment but, that the facilities are not responsible for the tool. This means the school does not have to provide handlers. The service animal must be under the control of the handler. In most cases, the handler is the person the dog has been trained to help. In some cases, commonly for children under the age of 14, the handler is the parent or guardian who was trained to instruct the dog and use it to help mitigate aspects of the child's disability. For example, a child with epilepsy may have a service dog which is trained to alert the handler to an oncoming seizure in the child so the handler can take appropriate actions such as getting the child to a safe place or administer medication. The ADA says if the animal is not under the handler's control, it can be removed from the environment. Having a service dog under your control includes having the dog leashed, harnessed or otherwise connected to you, and making sure its behavior is appropriate for all public settings—no barking, no jumping, no soliciting attention from others, no aggression and no protection. If the student is capable of being fully responsible for the dog in public, then the student/dog team must be allowed full access in school. What does it mean to be fully responsible? A student is fully responsible for their service dog when they can instruct the dog, independently, without the supervision or guidance of an adult, completing the trained skills and proving the dog is under their control in all public environments. Most children are not able to take on this level of responsibility until they are about 14 years old. It is important to note this is not a magic number. I have met many individuals who will never be able to be fully responsible for their service dogs and have met a few super star kids that were able to work their dogs independently before the age of 14. Individuals should be tested by their training program to determine if they are ready to take on the 24/7 responsibility. The test should not be given by the trainer of the dog or team. It should also not be given with a parent or guardian present. These people, who work closely with the dog or child, can unintentionally (and intentionally) interfere with the test. Body language and verbal communications from these adults cues the dog and child to the desired behavior. Parents have been known to disrupt a test by stopping strangers from approaching the team. While as a parent you want to protect your child, it is part of the test to have the child respond as an adult; to strangers and unexpected situations (food on the floor, someone trying to pet or feed the dog, the dog being startled, strange dogs approaching and more). An individual either needs supervision (facilitation or 3rd party handlers) or can function as an independent team without supervision. This is not a case of needing supervision at the mall but not at school (for example). The human of the canine/child team must be able evaluate all environments, anticipate situations and direct the dog avoiding mistakes and bad team behaviors. Facilitation or 3rd party handling means there is a trained adult who handles the dog—giving instructions, receiving information from the dog, supervises the team and assuring the dog remains under their control. These service dog teams must be allowed in the school when the dog is working with the student under the instruction or supervision of the parent, such as at an after-school activity like a basketball game or art show. Schools must allow for reasonable accommodations for the student / canine team. Having outdoor trash receptacles near the accessible area the student will use for the dog's bathroom needs and possibly adjusting chairs in the classroom to allow for the space needed by the dog are some examples of reasonable accommodations. Providing a person to attend the dog for the student is not expected or required of the school. Schools should be aware that fears and allergies are addressed by the ADA as not valid reasons for refusing a service dog. They should not try to put service dogs in an IEP as these are tools for independence not educational or assistive learning devices. Listing the service dog under a 501 with other non-educational accommodations is appropriate. Schools should also be aware that while they may request information on the dogs, they cannot require it—such as rabies certifications. Often parents and students are willing to provide this public record information to help the school be more secure in supporting the needs of the student. They do this out of a desire to work with the school—a request is often met with success where a requirement will be met with hostility and often defiance. Parents need to remember this is a tool to help their child not a battle of wills. Many parents expect too much from the school. The school is there for many children not just one. The schools have valid concerns and questions that need to be answered in a respectful way—offer to have someone come to the school for a meeting or assembly to address these questions. Remember not to ask for more than reasonable accommodations for your child. Parents are encouraged to notify the school several weeks prior to the dog starting school with the child. This time will allow the school to proactively notify parents of other students about the wonderful tool and gives the school time to address the needs of other students—such as documented dog allergies which might require adjusting how close the two students sit near each other. Schools are encouraged to educate the students and staff, in advance of the dog starting school when possible. Assemblies for students and separate time for facility and staff should be arranged. Canines for Disabled Kids offers these programs across the county, regardless of who trained the service dog. Many training programs also offer these programs. Programs last about one hour per session. However, when possible a larger window is recommended for staff and facility. Patience and respect are important. This is often the school's and the family's first experience of having a service dog on campus. 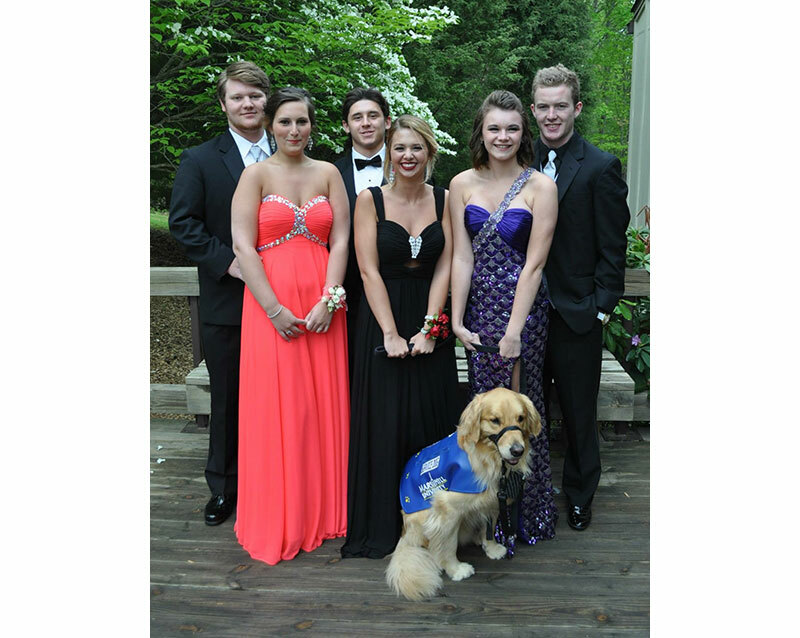 High schools, colleges and universities are seeing an increase of service dog teams with fully responsible students. Well trained and responsible, these teams are walking through campus, attending classes, living in dorms and participating fully in student life. While it may take the school community a little while to adjust to seeing these dogs in the classrooms, it takes the dogs no time at all to settle in and do their jobs. 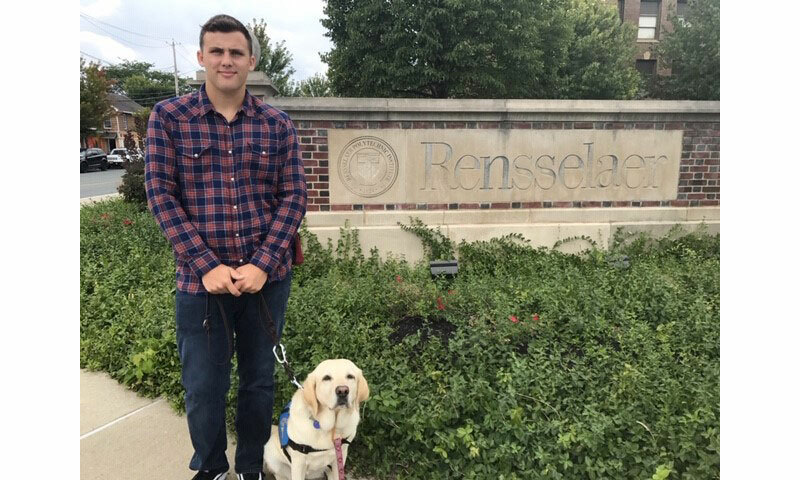 Some schools have commented that having service dogs on campus has had the secondary effect of making everyone more relaxed and kinder to each other. What a nice bonus! It is wonderful when the service dog becomes a natural part of the environment. Some schools even include them in the student's yearbook photos. Service dogs in schools? Yes, indeed. 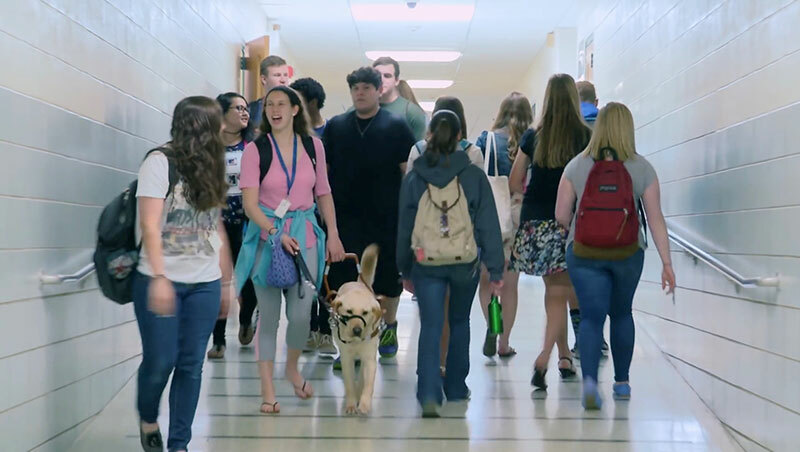 You may be welcoming service dog teams in your school this year.